Summary: Marlin is a clown fish who lives in the ocean (Pacific?). He and his mate have whipped up a batch of 400 baby fish who are still eggs at the beginning of the movie. They decide to name 199 of them "Marlin, Jr.", 200 of them some other name I dont recall and just one of them "Nemo". Life is good. Tragically, a carnivorous fish comes along, kills the girl fish and eats 399 eggs (I guess the predator just couldnt force that last one down). Marlin is rendered unconscious in a struggle to defend his mate and offspring. When he regains consciousness he finds that everything is gone except for a single huevo. He names the sole survivor "Nemo". On Nemos first day of school (chuckle, chuckle) he is captured by a diver. 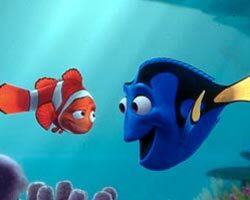 Marlin begins his quest to find Nemo and eventually does (big surprise but, what do you expect? Its a Disney movie). I like this movie. Its the best I have seen this year. The animation is beautiful, the script is well written and its funny. The movie is properly paced and there is plenty of action. I was thoroughly entertained and will probably watch it again. However, there ARE a few problems with the movie overall. 1 McDonalds promoted the movie on their Happy Meals. Kids could get a squirting tortoise with their chicken nuggets. Thats great. But, the bottom line is that the movies title character is a FISH. So, how do I explain to my child the guy in front of us ordering the Filet-O-Nemo sandwich? They should have thought that one through, I think. 2 After Nemo is captured, he ends up in a tank with several other saltwater fish. They make repeated attempts to make it back into the ocean. We find ourselves cheering them along to finally realize their freedom. This is a huge liability. Most children do not know the difference between freshwater and saltwater fish. I feel sorry for all of those freshwater fish that will lose their lives because some 5-year-old kid decided to set them free in the Atlantic. I also feel sorry for those parents who paid the 1200 dollars for that saltwater fish that will end up being flushed down the toilet by their kid (like the movie says, "all drains lead to the ocean"). Not mine. 3 While I agree that the "cleaner shrimp" named Jacques with the French accent should be a bottom-feeding scavenger, I cant accept the notion that he is obsessed with cleanliness. Since when are the French associated with cleanliness? Have any of the writers ever BEEN to France? 4 While I find it completely plausible for an Australian shark to be in a 12-step program, I wonder: if they arent eating fish, what do they eat? Men? Thats not the message I want my child to take away from a story. 5 Albert Brooks was a horrible choice for the voice of Marlin. He sounded like Winnie the Pooh. Very annoying. 6 I didnt see a ring on Marlins fin. Am I supposed to tell my kids that its ok to have 400 children without being married? What was she to him anyway? His baby-mama? At least they showed what will happen when you have children outside of wedlock: A) 99.9 percent of them will be murdered along with your girlfriend. B) The one kid who does survive will have birth defects (Nemo had an undersized "lucky" fin). C) Your handicapped child will be incarcerated at a young age. In the end, you will either die alone or risk your own life to break your child out of the "pen".